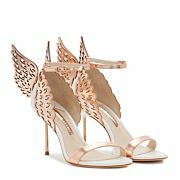 Our Signature Angel wing sandal is now available in a mid-heel. 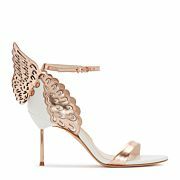 This beautiful white leather sandal finished with rose gold 3D laser cut Angel Wing detail is perfect for the dancefloor or for walking down the aisle. 60% Calf Leather, 40% Mirror Calf Leather Upper, 100% Calf Leather Sole. 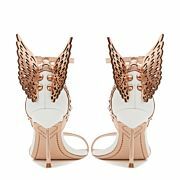 Please note this style does not have a screen-printed sole.